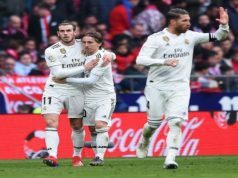 Real Madrid lost the little hopes they still had of lifting the La Liga title after losing 0-1 against Atletico Madrid in a poor game from Zinedine Zidane men. The visitors put in a brilliant defensive performance and Los Blancos were unable to threaten Jan Oblak during 90 minutes. A goal from Antoine Griezmann in a counter-attack gave Atleti their third consecutive win at the Santiago Bernabeu in La Liga. Los Merengues controlled possession at the start, but Diego Simeone men conceded little chances, with their 11 players defending tightly close. The first shot on target of the match took place in the 30th minute as Cristiano Ronaldo stroke a free kick from distance which brought a super save from Oblak. Keylor Navas was tested twice at the end of the first half. First, he saved a shot from Griezmann following a corner kick. And two minutes later he got down to keep out a low strike from Koke. Right at the start of the second half Ronaldo had a golden chance to open the score but his low strike was just wide of the far post. The Portuguese would regret that lost opportunity since five minutes later Atletico made the breakthrough as Griezmann played a super pass into Filipe Luis, who returned the favour and the Frenchman fired into the bottom corner. Saul Niguez could have made it 0-2 as he went through one-on-one with Navas, but the Los Blancos stopper made the save. In the last minutes, Madrid were close to levelling as Ronaldo missed an easy header and Danilo shot just wide of the post. 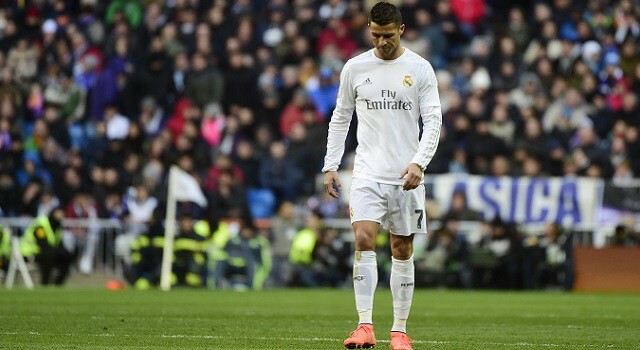 However, Real ended up losing and the Santiago Bernabeu fans jeered at the president after the whistle.